It goes without saying that we take our jobs seriously. That being said, when it’s time to tear down walls and build up highly engaged teams, we know how to have some serious fun! From BBQ’s to our Argus X-Games and our never ending team enriching events; we work hard to protect our positive tribal culture and ensure our customers are getting the best experience we can offer. Contact us to find out when our next culture talk will be. I am a key member of the Argus tribe. I am valued for my input and I value the input of others. I am an innovative, free thinker and I am not afraid to be different. I am an open-minded individual seeking a better way to seize opportunities and make “it” happen. I am empowered to make decisions that are in the best interest of our customers and Argus. I am committed to the long-term sustainability of Argus, I make it happen. I will not disappoint the customer. I will offer suggestions to increase profitability. I am approachable, flexible and accommodating at all times. I support my fellow teammates and offer a hand up when the opportunity presents itself. I am honest, reliable and trustworthy and will not comprise my standards. I strive to be a professional member of the Argus team at all times. I would like my critics to be undecided if I am working or playing, because to me, I am always doing both. Together we make Argus the exception to the rule, succeeding where others have failed. 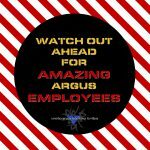 Argus sustains a work environment that is enjoyable beyond expectations. Argus grants us a lifestyle to be proud of and supports us in life, both personally and professionally.